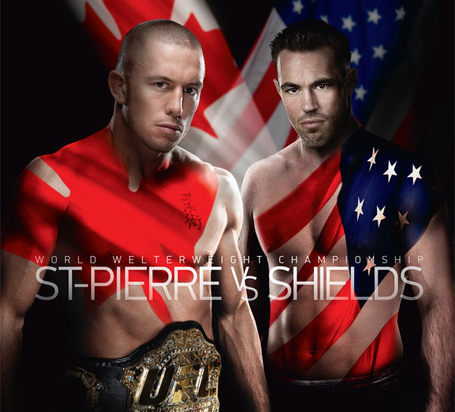 UFC 129: GSP vs Shields is on its way, and Fighting Insider has the betting odds in. Get ready to place some crisp bucks on BetUS.com! As usual, George St-Pierre is the people’s favorite, as he acquires a favorable -450 betting odd compare to Jake Shields +350. 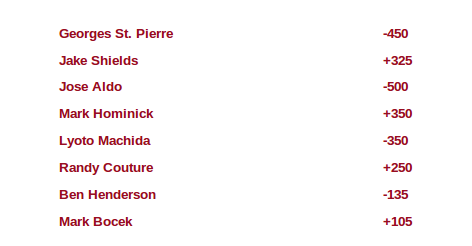 Also coming out with a sizable lead is Jose Aldo at -500 versus Mark Hominick’s +350. You can visit BetUS.com if you want your favorite fighter’s line to move in good faith. Check out the latest UFC 129 odds and betting lines below. This article is very nice one and gives in depth information, thank you for sharing your thoughts and time. Thanks for the information.. I am always looking forward for your next post. Hi there, Matt and James! Thank you for taking the time to comment. We’re glad that you’re pleased with our posts. Don’t worry, Fighting Insider will continue posting more UFC/MMA news and information that you will definitely look forward too.